Spots at the next intake for the European Handball Manager course starting on 1 July 2017 are getting rare. 20 spots are available, more than 10 people have already applied - a record number for early spring. The deadline to send the application is 30 April 2017. 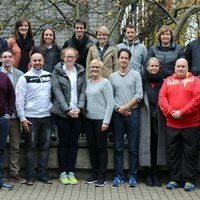 The European Handball Manager is a joint project of the German Sports University in Cologne and the European Handball Federation aiming to provide handball-centred knowledge in the fields of economy, law and communication. It takes place on an annual basis, with the teaching language alternating between German and English. The course starting this year will be held in German. The topics are constantly updated and are taught according to the newest developments in handball. "All lecturers are top class in their respective field," says Benjamin Chatton, managing director of German Bundesliga side TSV Hannover-Burgdorf and a participant of the 2015/16 course. "Who wants to be a first league handball manager, cannot go without this course," says Lina Heintschel von Heinegg, managing director of the TUSEM Essen Sport- & Marketing GmbH. More information and application criteria can be found at www.dshs-koeln.de/ehm.